The Force is strong with the Disney Fantasy. The Disney Cruise Line vessel is currently voyaging through the Caribbean (it's like Scarif!) and hosting Star Wars Day at Sea cruises. One day of the seven day sailings is all about the galaxy far, far away, and it is jammed with activities for all ages. I found my first Star Wars Day at Sea to be like a bite-sized combination of Star Wars Celebration and Star Wars Weekends (an event that used to happen at Disney's Hollywood Studios). In other words, it was a dream for a fan like myself. You might be wondering: really, how much can you do on a cruise ship? I understand. I had the same concerns. But keep in mind, the Fantasy is nearly four football fields long with 14 decks. They packed a whole lot of the Star Wars universe into the space. Let me take you through everything I did on Star Wars Day at Sea. I walked out of my stateroom at 7:45a.m., eager for my first meet and greet. I was greeted by the sounds of John Williams music playing in the hallway and throughout the ship. Ambiance, friends, ambiance. Then, I skipped to the D Lounge to meet Sabine and Ezra from Star Wars Rebels. Ahhh! They both appreciated my Rebel Alliance themed attire. Note: Sabine and Ezra were among characters who had a scheduled meet and greet, so I received a ticket in my stateroom the day before telling me the time and place for my encounter. Then after a quick breakfast, it was time for animation class in O'Gill's Pub (they used any/all available space). Since it was Star Wars Day, we learned how to draw Yoda. I tried. I know Yoda would not approve of that attitude. While I was in animation class, a wonderful thing started happening in the ship's atrium: Star Wars characters roamed. These were characters without set meet and greet times, so they wandered and interacted with guests. Imperial officers questioned anyone who looked suspicious. Jawas traded pins, napkins, and anything else they found useful with guests. I left this joyous scene for another character experience—one I cried over. 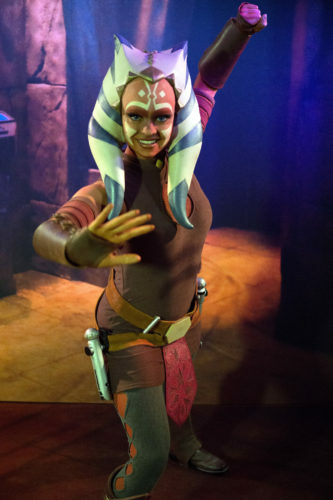 Guys, Disney Fantasy has Ahsoka Tano. This is the first ever Disney meet and greet opportunity with the character. She was dressed in a costume from Star Wars: The Clone Wars and she looked spot on. We chatted, but I was so excited I don't remember what she said. It was only 10:30a.m. and my day was made. Next on my list? (Yes, I made a list using the Navigator schedule Disney leaves in staterooms every night). Pool patrol! Stormtroopers and Boba Fett walked the area around the pool on deck 12. My rebel dress and tattoo were spotted within seconds. Don't worry. I didn't give up any Rebellion secrets. Not even when Boba Fett rappelled in. When the Empire left the deck, I went to a craft session and tried to make a paper lightsaber hilt. I failed because I didn't wait long enough for my glue to dry. I was so pumped I couldn't sit still. There's nothing quite like a Star Wars high. While I waited for my partner in crime to finish building his lightsaber, I took a moment to look around the room. I saw Star Wars t-shirts galore, two girls dressed as Rodians with green gems on their faces, Jedi, Sith—everyone in one place celebrating a story they love. Aww. Recovered from my moment of emotion, I went to the first costume celebration of the day. Fans in costume gathered in the atrium to show off their ensembles. I saw so many young girls dressed as Rey and Leia in the crowd that I got emotional again. Plus, look at the baby Yoda in the front of the picture. By this point, it was only 1:00p.m. And there were still about a million activities. Next, I went to a talk with Ashley Eckstein. Every Star Wars Day at Sea sailing has a special guest, and Eckstein was ours. She discussed Ahsoka and Her Universe in a 45 minute or so talk in one of the ship's theaters. Because I was ready for more sitting down, I followed Ashley's talk with a visit to Trials of the Temple, Disney Cruise's version of Jedi Training Academy. The interactive training show ran continuously throughout the day, and younglings showed up in force to reject the dark side and fight Darth Vader and the Seventh Sister. I left the festivities early so I could head back to the pool deck for a special aural treat: the ship's horn, which usually plays a Disney tune, played the Star Wars theme. My enthusiasm hit a wall around this point, so I stopped to peruse Star Wars Day at Sea merchandise and then hit Vista Cafe for a caffeinated recharge. My cappuccino was rebellious. Given the Vista's proximity to the lobby and atrium, it's ideal for people watching. I sat back with my cuppa and watched Zam Wesell lurk around corners and stormtroopers and Imperial officers have important meetings. Kids and adults dashed between them, huge smiles on every face. After a brief rest and a meet and greet with C-3PO and R2-D2, it was time for dinner. The servers and bartenders received specially themed uniforms for the day. The menu presented a "Voyage Through the Galaxy." I feasted on bantha steak empanadas, Obi-Wan shroom steak, and Leia-themed apricot pudding. Stuffed from dinner, I settled into The Tube, a London-themed bar, for a superfan trivia contest. I fared better than I usually do in trivia (I have a terrible memory) and watched as others killed it with their knowledge. Then, I got comfy in the biggest theater on the ship, the Walt Disney Theater, to watch Rogue One in 3D. Something about the ship gently rocking and moving made the battle scenes on Scarif more intense. Rogue One gave me another case of feelings. Star Wars has that effect, guys. But it wasn't the final event. The Star Wars Day at Sea finale is Summon the Force. The show incorporates all the characters I'd seen throughout the day in a presentation mixed with clips from the films; it was celebration of the Star Wars saga. They closed it out with fireworks at sea, set to John Williams music, of course. What a day. I participated in every activity I could and sucked the marrow out of the schedule, if you will. You can pick and choose, but I recommend going for the gold and doing everything possible on Star Wars Day at Sea. Your feet and body might need a little extra R&R to recover, but fortunately, you're on a cruise ship with a spa. Check out more photos from Star Wars Day at Sea in the gallery below. If you're interested in details on booking a galactic cruise this year or in 2018, visit Disney Cruise Line. The Star Wars Day at Sea Cruise was provided by Disney Cruise Line.